It is with great pleasure that I am able to share with you my first guest blog from the fantastic Gorilla Organization. Please have a read and then either leave a comment below or take the conversation to Twitter or Facebook. Are Gorilla Trekking Rules Strict Enough? 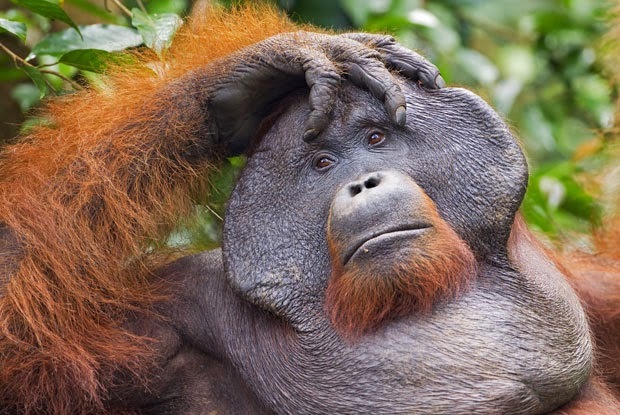 Over recent years wildlife authorities across Eastern and Central Africa have been in debate about making surgical respirator masks compulsory for tourists visiting the great apes. 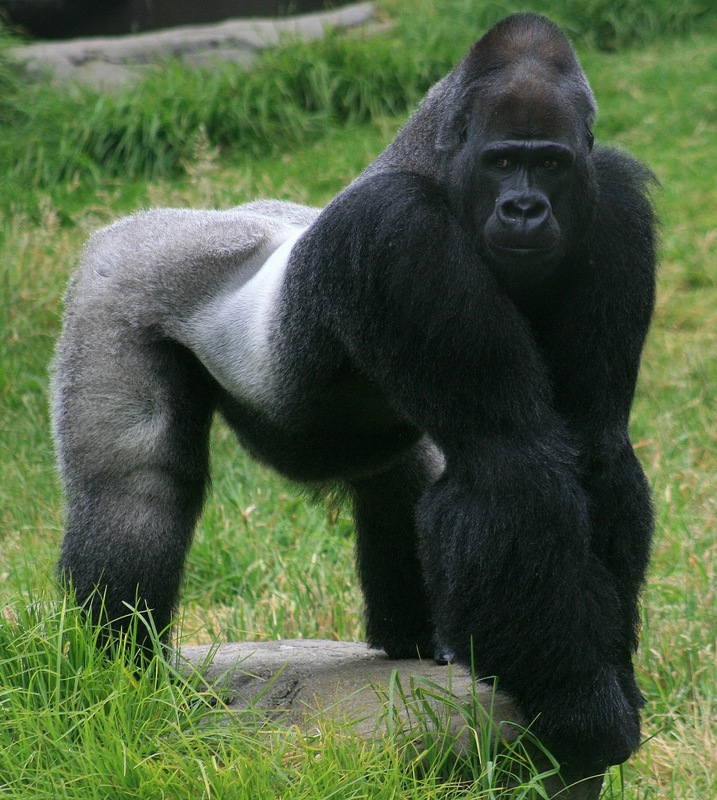 Due to the close genetic link between gorillas and humans, the risk of primates catching diseases such as the influenza virus is extremely high. Hence, introducing the N95 respirator masks, which catch bacteria coming from the wearer’s mouth and nose, could help minimize the transmittance of airborne disease and improve the protection of the critically-endangered gorillas. Although, the N95’s have not yet been made compulsory in all three countries where gorilla tourism is offered, the Gorilla Organization’s African staff are constantly encouraging the use of the respirators to visitors and staff members to ensure the health and survival of our beautiful cousins, and, on their regular excursions into the forests of the Virunga Mountains, they always lead by example. The debate has become particularly heated now that gorilla tourism has gone from being a niche activity for an intrepid few to being on the top of many people's travel 'bucket lists'. 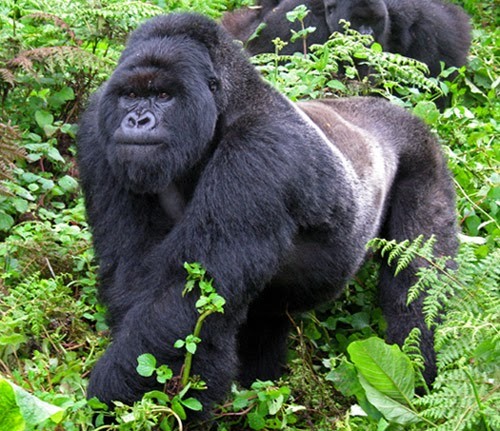 Indeed, trekking gorillas in Africa sounds like the perfect trip to anyone who is looking for an adventurous, unique and undeniably breath taking holiday; whether the journey goes to the DR Congo, Uganda or Rwanda, gorilla tourism is currently at hype among western travellers. 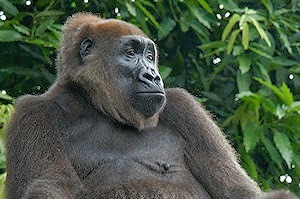 The 7-metre rule prohibits visitors from getting in immediate contact with gorillas. Unfortunately, this is not always preventable as infant gorillas especially are very curious and like to explore and mingle with tourists and rangers. Tourist group sizes cannot exceed more then 8 people, due to the possibility of human-disease transmission and causing stress to gorillas by increased noise levels or pictures being taken (which is generally allowed without flash). Thus, the time spent on site is strictly limited to a maximum of 1 hour per tour. Each tourist is permitted to carry a bottle of water, a first aid kid and a camera, though not a specialist video camera without a special permit. Foods need to be eaten before getting in contact with gorillas and smoking is strictly prohibited throughout the entire tour. Though great ape tourism comes with numerous regulations and, some would say, appears to be of some risk to the primates, it is of great significance as it helps fund a range of conservation and local community projects. Funds that are being raised from sold gorilla permits, which cost up to 500 USD per visitor, pay the wages of rangers, most of whom are recruited form local communities, and fund initiatives aimed at educating farmers and reformed poachers on issues such as poaching and habitat loss. These are all concerns that the Gorilla Organization shares, as poaching and habitat loss are still the most common threats primates face. This is why the Gorilla Organization’s staff members educate local farmers on organic sustainable agriculture, with the purpose of teaching individuals on how to grow foods to support their families. Simultaneously this also prevents locals from searching aliments in the forests, which aids to the protection of gorillas natural habitat. Written by Sharon Legae - Communications Assistant for the Gorilla Organization. 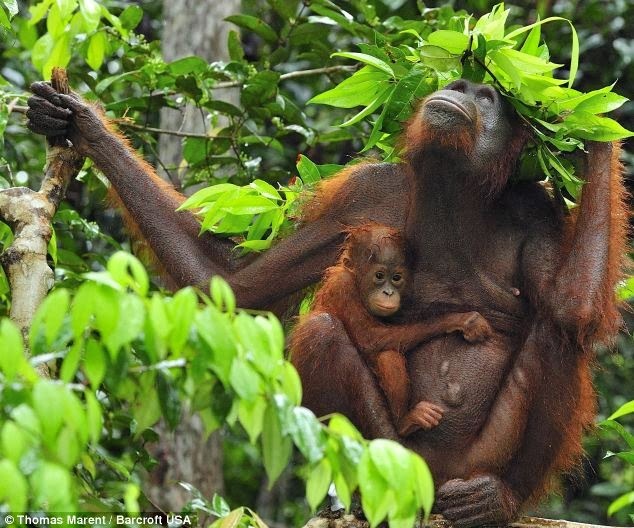 Macfie, E., and Wiliamson, E. (2010) Best Practical Guideline for Great Ape Tourism. 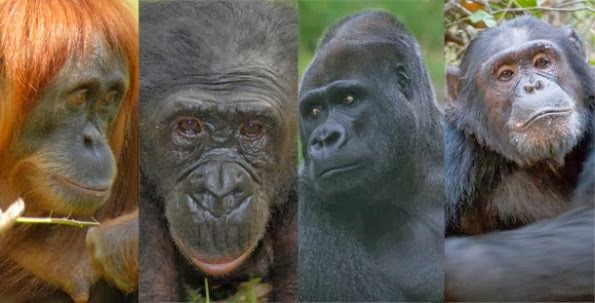 The Gorilla Organization has worked to save the world's last remaining gorillas in the wild from extinction, carrying on through genocide, natural disasters and war. Albert Einstein - "Nothing will benefit human health and increase chances of survival for life on earth as much as the evolution to a vegetarian diet." I have just watched the award winning Vegucated and it was a well thought out, humourous and entertaining film. Being only an hour long it keeps your attention and highlights all the important issues around veganism without preaching to you. "Part sociological experiment and part adventure comedy, Vegucated is an award-winning, guerrilla-style documentary that follows three meat- and cheese-loving New Yorkers who agree to adopt a vegan diet for six weeks. Lured by tales of weight lost and health regained, they begin to uncover the hidden sides of animal agriculture that make them wonder whether solutions offered in films like Food, Inc. go far enough. 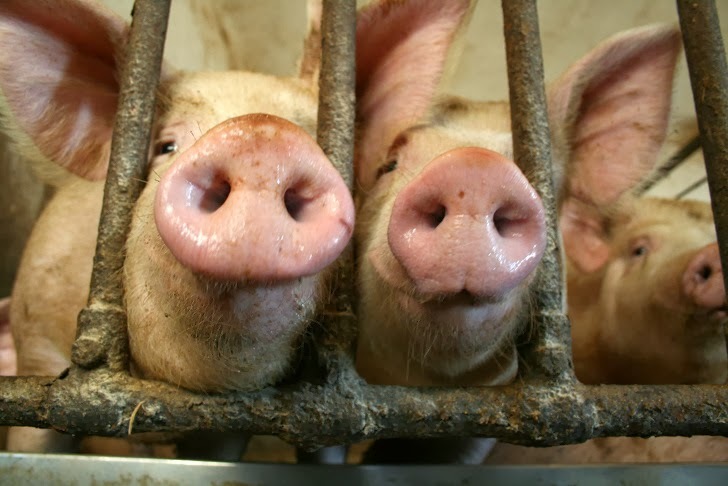 Before long, they find themselves risking everything to expose an industry they supported just weeks before, but can their convictions carry them through when times get tough?" For me this film touched on exactly why I am vegan and will always chose to be. It is simple really, we have a choice to eat a diet that not only makes and keeps us healthy, but also doesn't support the suffering and killing of millions of animals every year. More and more evidence is coming out showing how meat and dairy is not only bad for us but single handily the reason behind so much that is wrong in this world. Don't just take my word for it though, look into it and you will see how reducing our meat and dairy not only does you good, but also the planet. In 2009 Dr Rajendra Pachauri, chair of the United Nations Intergovernmental Panel on Climate Change said"'Give up meat for one day [a week] initially, and decrease it from there." 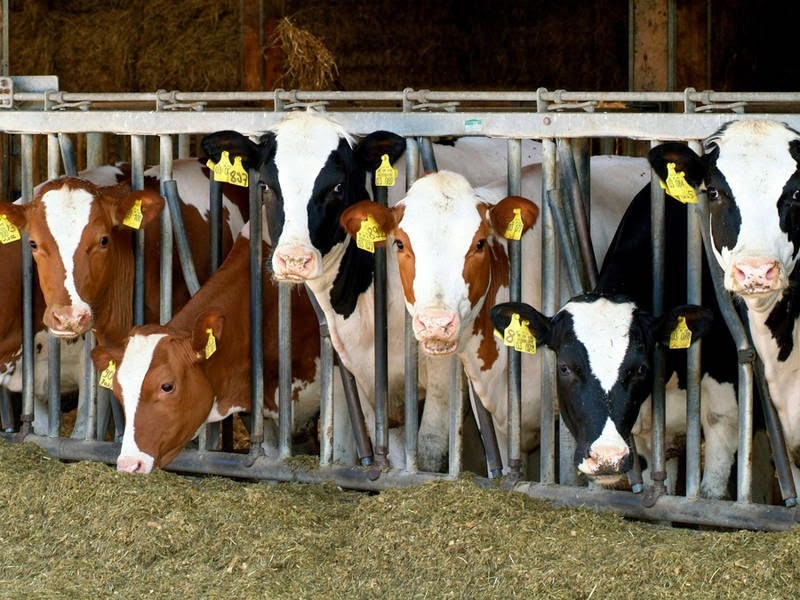 This is because it is so much more environmentally damaging to eat meat and dairy. You have to first grow all the plant food and then instead of eating it, ship it to the livestock around the world and feed it to them. Research has shown it takes roughly 10 grams of plant protein to create 1 gram of animal protein. Mainly due to the fact you lose roughly 90% of the energy on every step of the food chain, so feeding it to animals is pretty wasteful. Especially as the population reference bureau states we currently grow enough food in the world to feed 10 billion. While almost a billion people, including 200 million children go hungry everyday. The American Diabetes Association says that a vegan diet can help prevent and manage diabetes and the China Study shows how when animal foods are introduced into a diet, cancer and heart diseases increase. A study published in the Journal of Urology showed that men with an early stage of prostate cancer can stop or even reveres the effects with dramatic changes with their diet and lifestyle. This is only the tip of the iceberg. So please check out Vegucated and listen to the otherside of the story and realise what the truth really is. 4. Research on environmental impact of different diets. "In 1960 there were a million chimpanzees in the wild, today just one fifth of that number remains." That is the statement you are shown at the end of 'Chimpanzee' a Disney Nature documentary following the life of young Oscar. 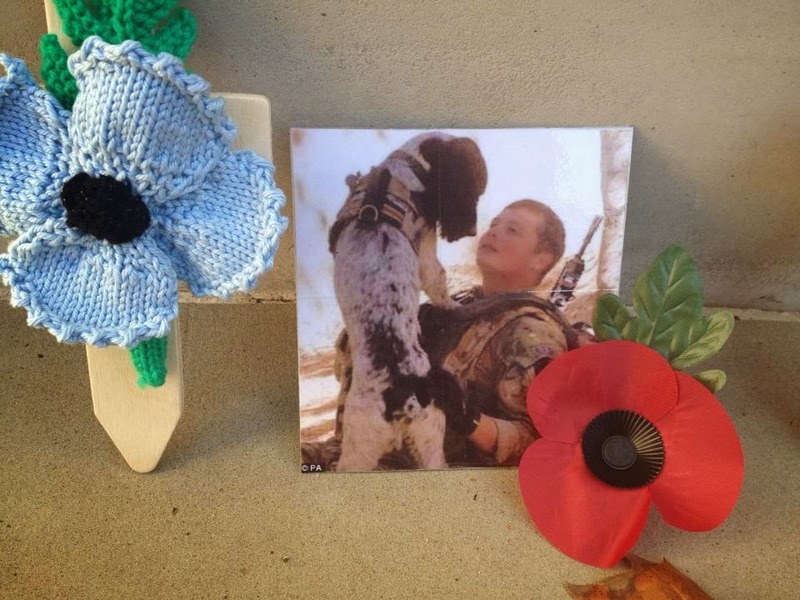 It is quite shocking and while reading it you have the footage of Oscar playing with the Alpha male Freddy; really touching once you know why they are together (no I won't ruin it for you). The documentary has the narration of Tim Allen throughout and it is a beautifully shot film really giving you the feel like you are in among the group. 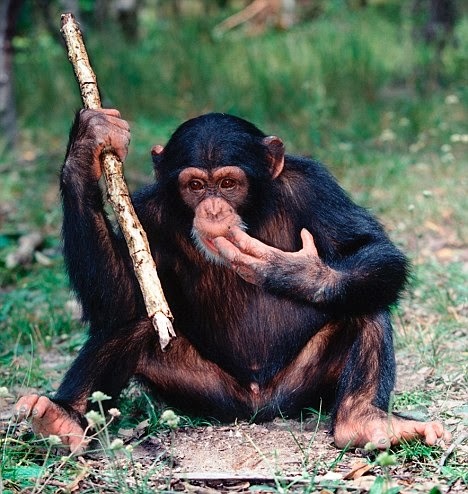 You get to discover all the wonderful things chimpanzees have learnt to do from organised hunts, to tool use and how much they don't like the rain. While watching it you can't help but realise how 'human' like these guys are, the way they move their hands, the faces they pull and the way they interact with each other. Creationism takes a real blow and the theory of evolution is just staring you in the face. Although it may not be a real scientific programme I am sure it will go far to raise the profile and awareness of our distant cousins. It feels like it is definitely aimed at children and so for adults it can become a bit samey and the narration can get a bit annoying. None the less I would encourage you to watch it and if you have children or teach a class show it to them. You fall in love with little Oscar, so it can hopefully galvanise the young generations to get involved with the plight of chimpanzees. Sir David Attenborough talks about the Wild Chimpanzee Foundation who have monitored Oscar and his family for over 30 years. 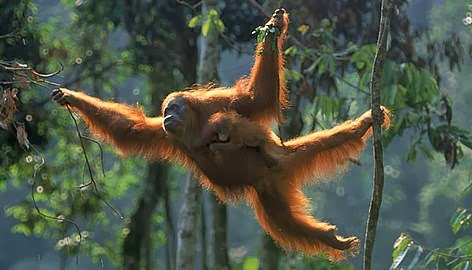 This week I have been writing and promoting the plight of the great apes that we share this planet with. 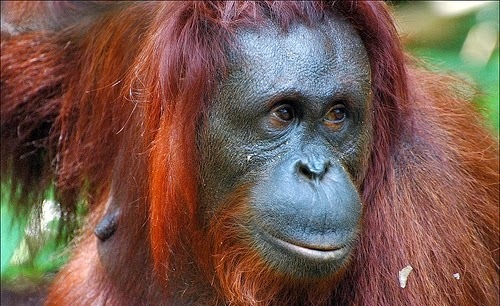 What is it you think needs to be done to ensure we don't lose our distant cousins forever? Don't let the work of people like Dian Fossey and Jim Cronin fail. 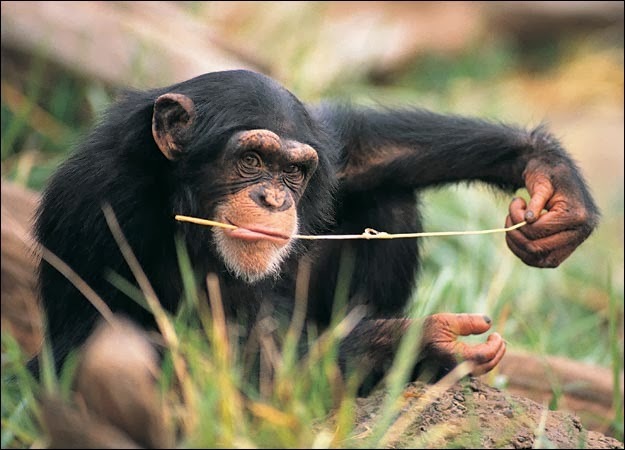 Day 4 of #apeweek brings us to the Chimpanzee and the last of the 4 great apes. 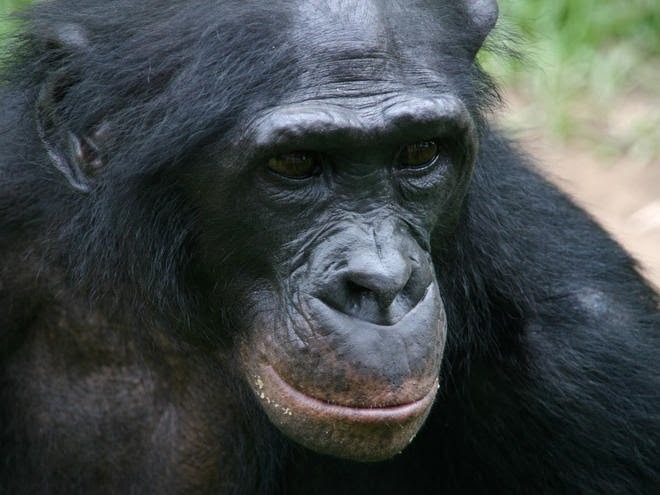 Probably the most well known of the great apes especially for their tool use, which we will come on to a bit later. 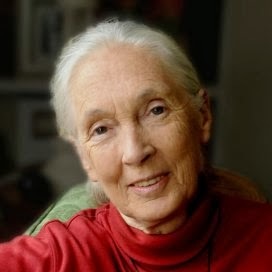 It is the great Jane Goodall that we have to thank for raising the plight of the Chimpanzee to a worldwide audience. 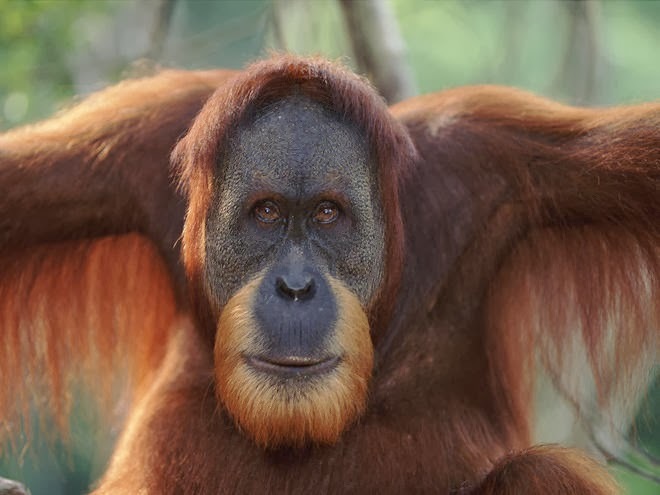 Her studies since the sixties has enabled us to learn so much about our closest relative, and we will look at that in more detail further on. 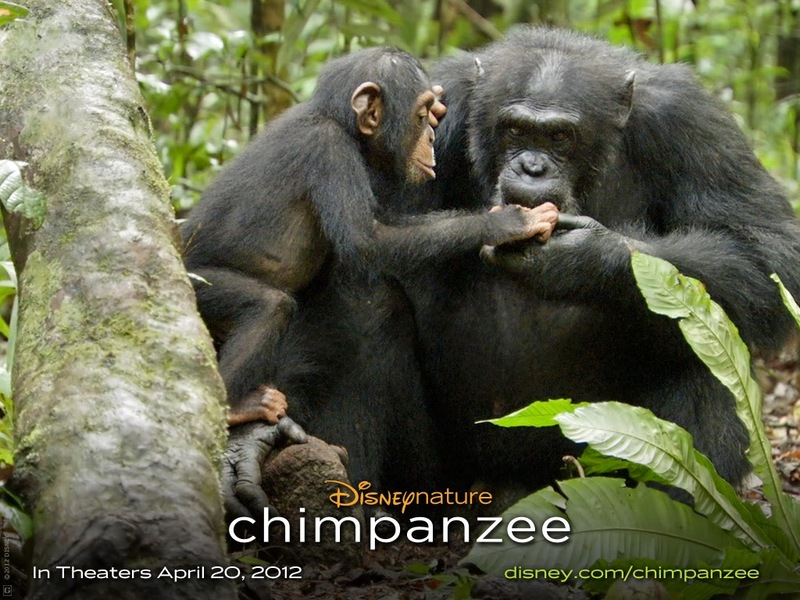 So sit back and enjoy learning more about our cousin the Chimpanzee. 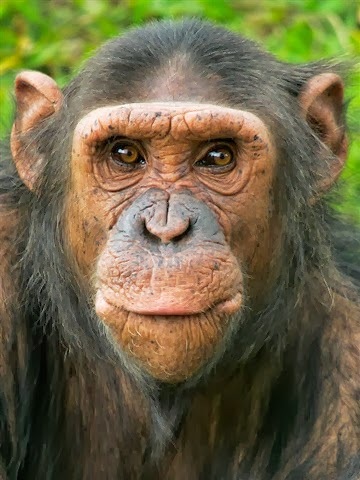 Size - Generally speaking Chimpanzees range from 74-96cm in length and 40-60kg in weight for males and 32-47kg in females. Appearance - Black coat, a naked face and infants have this lovely white tail tuft. They also have pinkish to black skin on their faces, ears, palms of their hands, and soles of their feet. 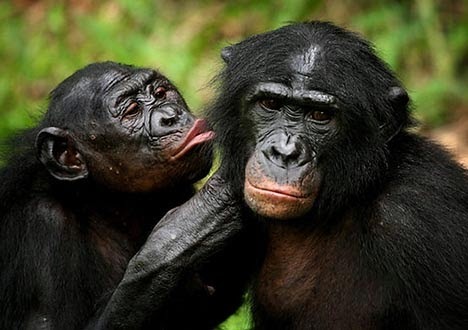 Bonobos, which are closely related, are generally lighter, a more slender build, red lips and the hair has a central parting. Habitat - Mainly found in forest areas and in many countries in sub-Saharan Africa. Diet - Fruit, leaves, seeds, plant galls, animal prey including mammals, birds and insects. 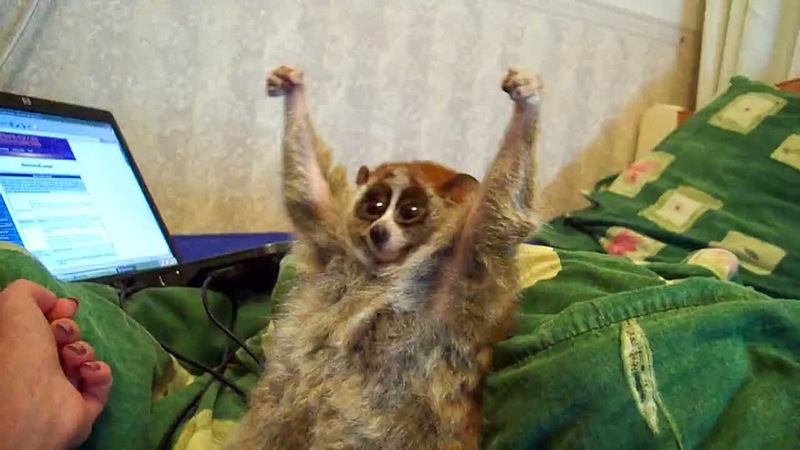 They also hunt other primates, especially colobus monkeys. Life History - Gestation is around 8 months with sexual maturity being reached in males at around 13 years and females 11 years. Their life span is around the 50-60 year mark. General behaviour - Active during the day and build nests in trees at night, the males are dominant within their social structure. 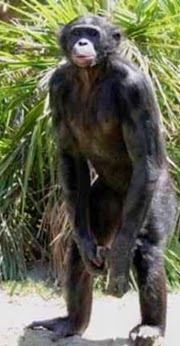 The Chimpanzee is classed as endangered and their numbers are estimated to be around 172,000 - 3000,000 (IUCN red list). In fact in recent years that are said to have been made extinct within Burkina Faso and this is due to the threats they face. "In July 1960, at the age of 26, Jane Goodall traveled from England to what is today Tanzania and bravely entered the little-known world of wild chimpanzees. She was equipped with nothing more than a notebook and a pair of binoculars. But with her unyielding patience and characteristic optimism, she won the trust of these initially shy creatures. She managed to open a window into their sometimes strange and often familiar-seeming lives. The public was fascinated and remains so to this day. Today, Jane’s work revolves around inspiring action on behalf of endangered species, particularly chimpanzees, and encouraging people to do their part to make the world a better place for people, animals, and the environment we all share. 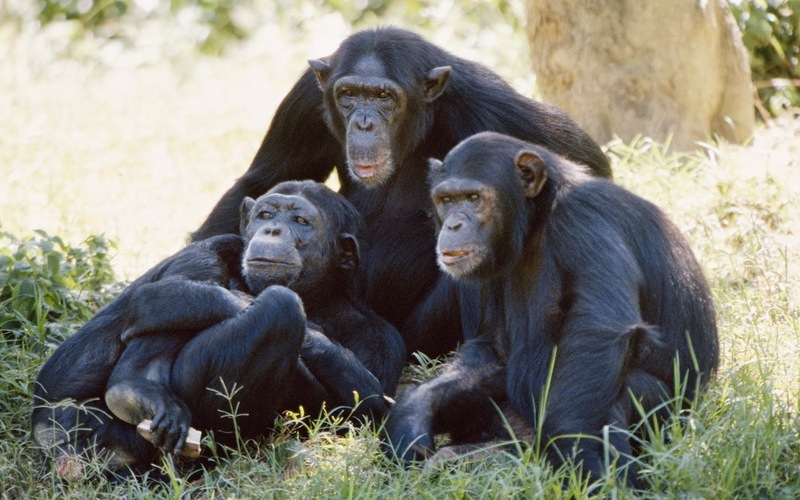 The Jane Goodall Institute works to protect the famous chimpanzees of Gombe National Park in Tanzania, but recognizes this can’t be accomplished without a comprehensive approach that addresses the needs of local people who are critical to chimpanzee survival. Our community-centered conservation programs in Africa include sustainable development projects that engage local people as true partners. These programs began around Gombe in 1994, but have since been replicated in other parts of the continent. 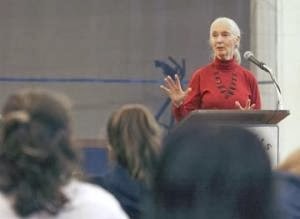 Likewise, Jane Goodall’s Roots & Shoots, which Jane started with a group of Tanzania students in 1991, is today the Institute’s global environmental and humanitarian youth program for young people from preschool through university with nearly 150,000 members in more than 120 countries." It is day two of #apeweek and I am very excited to be writing about Gorillas because I grew up reading about the legacy of Dian Fossey. Indeed it was the very first charity I was a member of, with my mother, and when I read Gorillas in the Mist, and watched the film, I knew I would forever be smitten with the plight of the Gorilla. 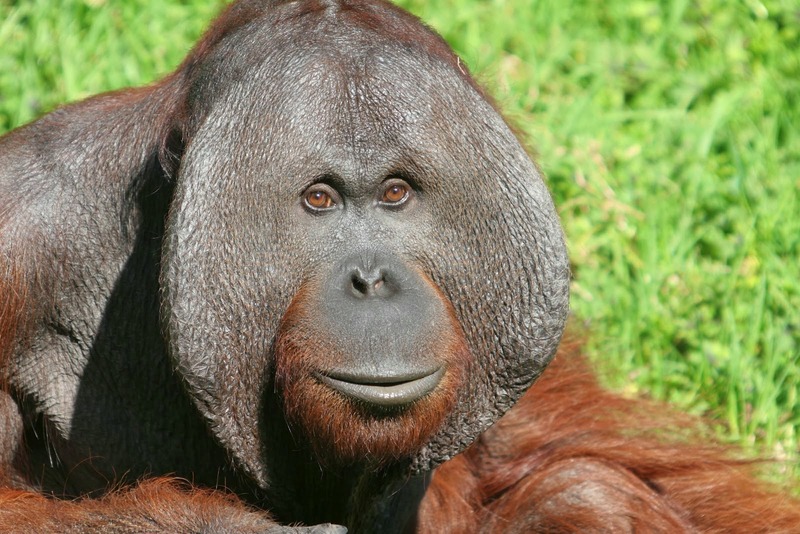 Size - Head and body length can be up to 180cm with their weight being between 90-180kg. Appearance - Black or brownish grey coat, the adult males develop a silver back & a crest of bone & muscle on the top of their head. Habitat - The tropical forests of Central Africa on either side of the Congo basin, found in the Democratic Republic of the Congo (DRC), Rwanda, Uganda, Angola, Cameroon, Congo, Central African Republic (CAR), Equatorial Guinea (Eq.G), Gabon & Nigeria. Diet - Fruit, leaves, flowers, seeds, stems, bark, roots & some invertebrates. Life History - Gestation around 8-9 months, with sexual maturity being reached around 8-10 years and life span up to 50 years. Behaviour - Groups of 5-60 mixed with males and females, not really territorial & make new nests at night with males on the ground and sometimes females and young in the trees. The Mountain Gorilla (Gorilla beringei beringei) - found in the DRC, Rwanda and Uganda and classed as endangered on the IUCN red list. There are said to be fewer than 800 left in the wild and they have developed longer hair to cope with the colder temperatures. The Eastern Lowland Gorilla (Gorilla beringei graueri) - found in the DRC and also classed as endangered on the IUCN red list. Said to be fewer than 5,000 in the wild and are noted as being the largest of the Gorillas and therefore the largest primate on the earth. 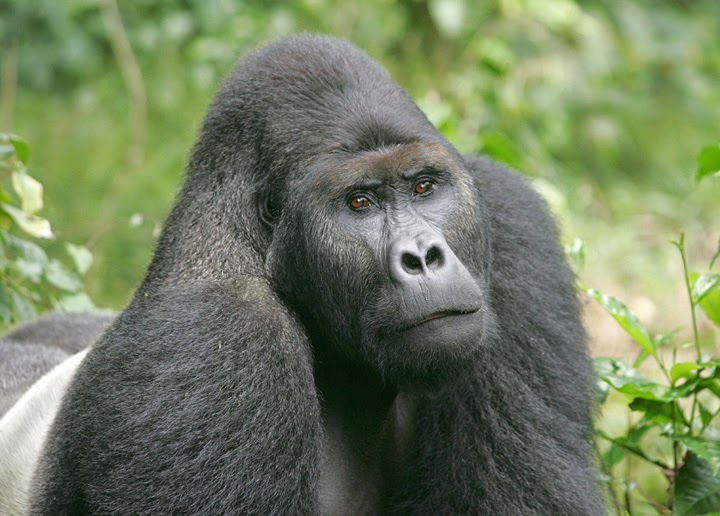 Adult males can reach up to 250KG and although similar to Mountain Gorillas they have shorter hair, narrower faces and rounder nostrils. The Western Lowland Gorilla (Gorilla gorilla gorilla) - found in Angola, Cameroon, Congo, CAR, DRC, Eq.G & Gabon and classed as critically endangered on the IUCN red list. Estimated numbers are fewer than 200,000 and they also live in family groups. However, unlike the Eastern Lowland Gorillas the Western has been known to split up during the day and reunite in the evening to sleep. They are also known for they love of fruit that makes up a large part of their diet. Finally the Cross River Gorilla (Gorilla gorilla diehli) - found only on the boarders of Cameroon and Nigeria and said to number fewer than 300; therefore the most endangered of any great ape. 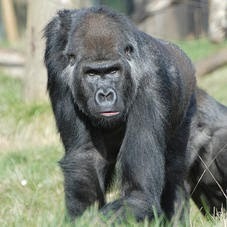 Like the Western Lowland Gorilla they are classed as critically endangered on the IUCN red list. They are very similar to the western, but their group sizes tend to be smaller. Logging - Legal and Illegal logging that is reducing the size of the Gorillas natural habitat making it harder and harder for them to survive and have stable populations. Born in San Francisco, in 1932. Her strong interest in animals led her to enter college as a pre-veterinary student. First trip to Africa in 1963. Returned to Africa in December 1966, to begin a long-term study of the mountain gorillas. She initially set up camp in the Democratic Republic of Congo (then Zaire), but due to political upheaval moved to Rwanda in 1967. On September 24, 1967, Dian Fossey established the Karisoke Research Center, between Mt. Karisimbi and Mt. Visoke. The name "Karisoke" comes from merging the names of the two volcanoes. Dian Fossey’s objectives were to study gorilla ecology, demography and social organization. She found that in order to accomplish these goals, she needed to recognize individual gorillas. This required that the gorillas become accustomed to (or habituated to) her presence, so that she might get close enough to them to tell them apart. By imitating gorilla behaviors and vocalizations, Fossey began to gain their trust, and in 1970 an adult male gorilla she had named Peanuts reached out to touch her hand. Intense observations over thousands of hours enabled Dian Fossey to gain the gorillas’ trust and bring forth in her studies new knowledge about their behavior. Stories and photographs of her discoveries were published in National Geographic magazine and elsewhere. In 1978, after one of Dian Fossey’s favorite gorillas, Digit, was killed by poachers, she established the Digit Fund to help raise money for gorilla protection efforts. The Digit Fund was later renamed the Dian Fossey Gorilla Fund International. On Dec. 26, 1985, Dr. Dian Fossey was murdered while in her cabin at Karisoke. In 1988, the life and work of Dr. Dian Fossey were portrayed in a movie based on her book. Sigourney Weaver starred as Fossey, and later became the honorary chairperson of what is now the Dian Fossey Gorilla Fund International. The Dian Fossey Gorilla Fund International - To continue the work Dian Fossey started in 1967. The Gorilla Organization - the people behind the famous Gorilla run. The Gorilla Doctors - providing hands on veterinary care to the mountain gorillas. Well I chose to start my blog in November 2013 and by the end of the year it had had over 1,600 hits. This is beyond what I could have imagined and I am truly grateful to everyone who stopped by.